We will have a look at maintenace and testing of scaffold planks to assist users in maximising their service life while maintaining a nescessary level of safety.Maintenance, entailing regular inspections and testing is nescessary to ensure that scaffold planks nearing the end of their service life (and that are no longer safe for use) are detected and removed from service.To maximise service life and ensure safety in use, planks should not be subjected to mechanical, physical or chemical forces. Such forces are likely to cause damage and render the plank unsafe for use. 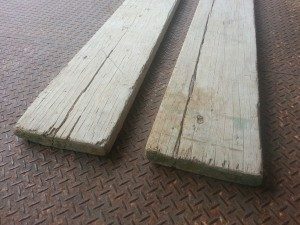 Where planks have been subjected to physical, mechanical or chemical degradation, they must be tested to verify continued use. Fractures resulting from overload may not be readily apparent by inspection, proof testing is the only means of detection. Therefore regular inspection and strength testing is recommended.Whilst planks are largely unaffected by exposure to moderate strength acids or alkalis, strong acids and alkalis will attack the naturally occurring lignin which binds wood fibre and in time cause a reduction in plank strength. For planks used in these environments regular proof testing is recommended.The frequency of testing depends upon the nature of use. Furthermore, any plank subject to trauma or showing any obvious signs of degradation should be withdrawn from use pending verification of strength by proof testing.